In the previous Yahoo Pipes Tutorial, I briefly described what every module does. 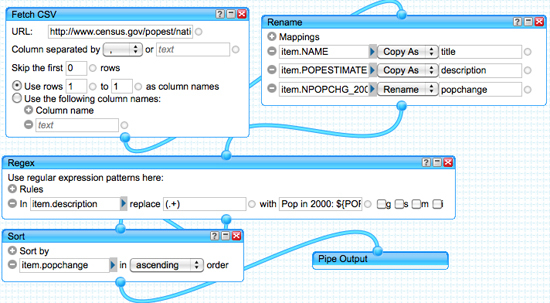 In this article, I demonstrate how to do many useful things with Yahoo Pipes. Remember, the ultimate goal is to create great custom feeds that will automatically get posted on our websites. I showed you how to do this in a previous article How to Make Money Blogging. With those techniques, I was able to make an extra $11 bucks, after all fees, for each site I made. Each site took less than 20 minutes to put together and then required no maintanence. With Yahoo Pipes pulling even better articles, I’m pulling in $26 on average. Normally, when you pull information from an RSS feed, you only get an abbreviated version of the article. Yahoo Pipes allow you to pull the entire article using the following steps. This is what the Yahoo Pipe page looks like after everything is set up. I’ll then describe the steps. This Yahoo Pipe example, pulls every article from the current Huffington Post RSS feed, along with the whole article, if the title contains the word Hollywood. Here is how it’s built. To grab the whole article, rather than just the abbreviated description in the feed, you need the Loop and Fetch Page Modules. You could stop there, but I’ll explain how the Yahoo Pipes Filter Module works. With the Filter Module, you can either Block or Allow certain articles based of whether a certain word lies within some part of a feed item. Here I choose to only include articles that contained “Hollywood”, in the title. Here is how I did that. I then connected all of my modules, as you see above. Then I clicked save and done. CSV stands for Comma Separated Values. Here I’ll show you how to pull data from a CSV, and manipulate it however you see fit. 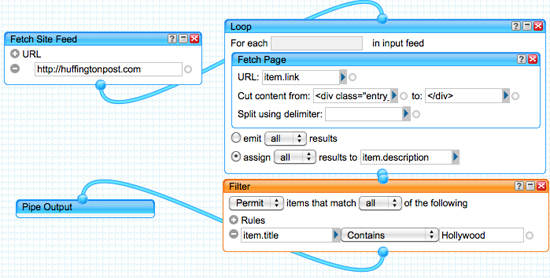 I then use the Regex, or Regular Expression module, to change the value of the description for each item in the feed. I then use the Sort Module to sort the order of the data in the new feed I created. Here I created an RSS feed from images that I pulled from the Flickr website. All I did was drag the Flickr Module on to the stage and asked it to return 50 photos of Pittsburgh, taken in Pittsburgh. It returned a map detailing where the photos were taken. It also returned a list of the photos and stuck them in a new RSS feed. You could also use the Flickr module to populate your articles with interesting photos. I grabbed my pipe RSS feed url for a particular topic and slammed it into RSS Graffiti on a particular Facebook page. It ran the first day and now I receive the message “An error occurred while retrieving the feed. A feed could not be found at http://pipes.yahoo.com/pipes/pipe.run?_id=6338de6976fbe3687c30703e457c939b&_render=rss“. Am I doing something wrong? Should I be hooking up the pipe with the Notes page? My ultimate goal was to grab a bunch of useful blogs related to a particular topic and have 1 or 2 post randomly each day. Any help will be appreciated. Well the feed is up and running. I checked into a few things and found that you get this error because of DNS issues. This can happen for numerous reasons and it is normally a temporary problem that will go away on its own. I do know personally that Yahoo gets really irritated if you retrieve data from the feed to often (Every 5 Minutes). I’d only retrieve from it twice per hour at most. Excellent post! Grabbing the full article with Yahoo Pipes instead of just the summary is great for autoblogs. But use this method at your own risk because there are some obvious legal issues by scraping the content. You might tick off a few people! Great technique none the less though. Thanks for pointing that out. I only grab the first 800 characters from sites. My goal being to provide readers with just enough information to find out if they want to continue reading. I also always place a link to the original article and leave a reference to the original poster in the title. Is there any way to translate the full grabbed post from a language to another? The translate-box works only for the title and the short summery description, but for the full description it don’t translate. Any fixes on this one? Thnx for the tutorial Derek. Really appreciate your work. I’ve tried to accomplish the same results as it has come out for you using Y-pipes grabbing from “huffingtonpost.com”. Error fetching http://www.huffingtonpost.com: Invalid XML document: org.xml.sax.SAXParseException: The entity name must immediately follow the ‘&’ in the entity reference. B.t.w. I have tried some other sites to grab from them also, but the error is showing all the time as the result. I know that I filled in all the fields correctly, so I’m confused here because of it. Please Derek, can you tell me how to get around this so i can get the full article anyway? I’ll look into it, but it seems that Yahoo has pretty much abandoned pipes. The results were very spotty so I just wrote my own website scrapers.